Surprisingly, my family stumbled across this quaint ramen house when we were shopping for a new dining table. My parents picked out a lovely Chinese style rosewood table at a killer discount since my dad is so awesome at haggling. I don't think I could ever haggle like that. My mom would also not fork over the payment until the proprietor agreed to throw in the shipping. As they were handling the agreement, my siblings and I walked around the street to see what type of restaurants there were for lunch. 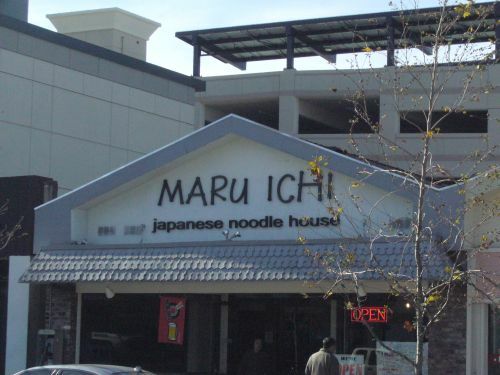 My brother had his eye on Maru Ichi which was directly across the street. I wasn't really feeling like eating ramen but since my brother expressed his craving for it I went along. 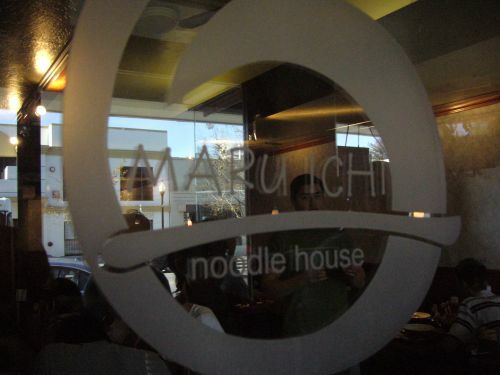 After the transaction, my family headed over to Maru Ichi, signed in and waited to be seated. 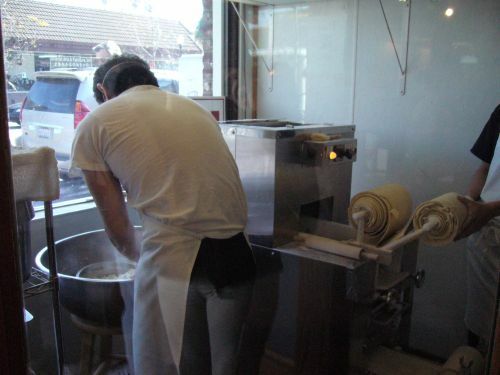 I immediately notice that they had a small glass enclosed room in a corner at the front in which you could watch them make batches of ramen noodles. It was very interesting to watch them make the noodles and piqued my appetite for ramen. 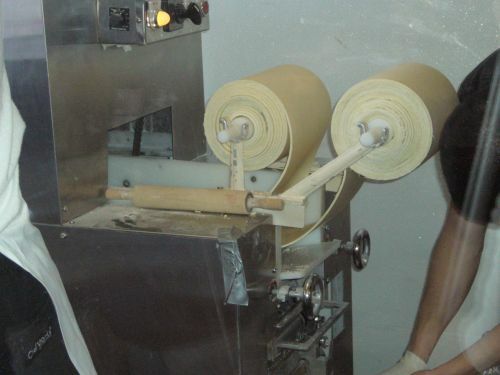 My father was very intrigued by the noodle making process but I don't think enough to make them himself even though we have a manual noodle making machine at home. When we were seated, we were promptly handed menus and glasses of water. I immediately noticed the Kuoro ramen($6.90) which sounded interesting because I had never tried this type. 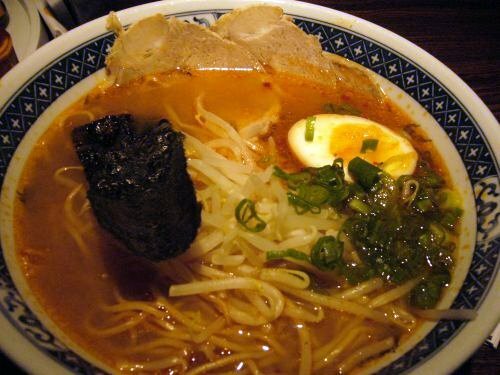 According to the menu, kuro ramen meaning black ramen is made with browned garlic and was invented in a noodle shop in Hitoyoshi, Japan, some 45 years ago. However, the broth didn't appear to be black but an opaque, earthy brown. My father and brother got this and I got the spicy miso ramen($7.90). I asked for mild but it was still a little too spicy for me so I couldn't finish it. The meat was however quite tender and the soup though too spicy for my tongue was very flavorful. The noodles also had a very nice bite to it. The kuro ramen's soup had a more heartier and developed taste. There was also a very distinct sesame taste and it did look like there was a thin layer of black sesame oil floating on the top of the soup. I think regardless of whether I had gotten spicy or not spicy miso ramen that I still preferred the kuro ramen. I should have known better even after the waitress said it was what they were known for. Hmm, I've never heard of Kuro-ramen, sounds and looks delicious though. 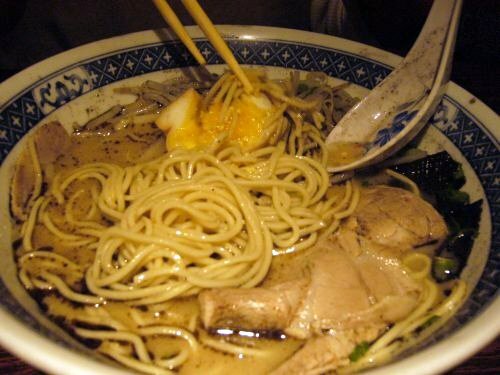 Thanks for posting about it, definitely puts it on my list of ramen places to try! Thanks for visiting Foodhoe! I also had never heard of Kuro ramen until I visited this Ramen joint. I'll sure be visiting the Milpitas joint since it's closer to my home in SJ when I'm visiting up in the Bay Area. This review reminds me I should head to Mt. View more often to eat. Thanks, I put it on my list to try. Thanks for visiting Mrs. L. It's always a joy to stumble onto a food gem without prior recommendations.